Last Saturday night started out much like any other night. I Arrived at the ramp after 9, no wind and a bit humid. I thought to myself that it would probably be a bad night for bugs. Little did I realize just how bad it would be. There wasn’t much boat traffic, which was kind of surprising considering the weather and what day it was. The water was still clear and no visible signs of any floating weeds. By 9:30 pm I was in my usual spot and setting lines. I started off with a couple of spoons and a #9 Original Rapala. One of the spoons was a new pattern I picked up last year and never used until tonight. I figured with the clear water we had been experiencing a spoon with a natural finish would do pretty well. It didn’t take long to find out. 10 minutes later I had two in the cooler and both of them came on that spoon. I was feeling pretty good about how this night was going to go and then it happened. First it was one, then a couple which turned into a swarm. Ten’s of thousands of mayflies began hatching all around me. They weren’t the big hex’s, a slightly smaller cream colored version, but they were everywhere. I had never been in the center of a hatch like this before and it was awe inspiring. The numbers were unbelievable and I could only imagine what was going on below the surface. I didn’t think about it at first but this was going to give me the opportunity to see just how active the walleye are during a mayfly hatch. 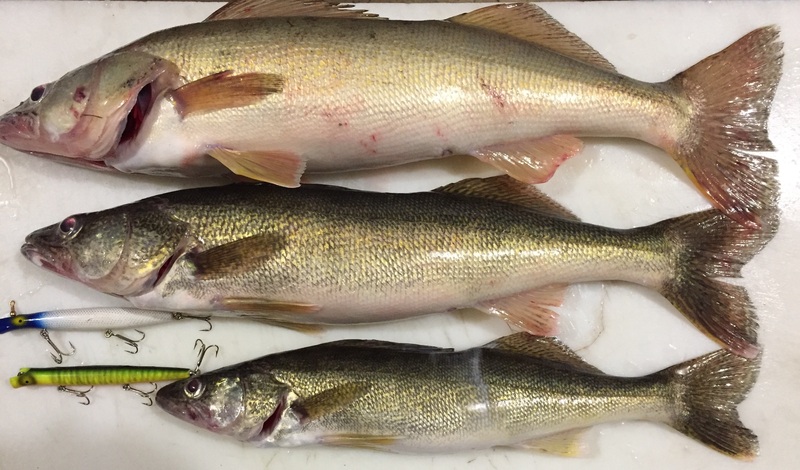 I had heard from multiple people that you can’t catch walleye during a hatch. I never really believed that and I was about to find out first hand. I don’t know how much the walleye feed on the nymphs but I’m sure they are chasing after the baitfish that are feeding on the nymphs. Five minutes into the hatch I got my answer when number 3 hit that same spoon. So there I was, 10 pm and in the middle of a mayfly hatch with 3 in the cooler when I got my next surprise. Fireworks. Turns out the Duck Dynasty boat was occupied that evening. The first one exploded right on the deck but after that they got their act together and continued to launch them out over the river for the next 30 minutes. I wonder if that would be considered littering? Not much I could do about it so I stayed on the west end of the river until they were done. I really didn’t want one to land in my lap, especially after I watched them drop one onto their dock and explode and burn for a bit. Around 10:30 pm they quit along with just about everyone else on the island so I slowly made my way back over to where I wanted to be. By now the hatch had ended but I was still plucking bugs off of me and my boat. During this time I managed to catch a few blankity blanks (apparently they didn’t get the memo) and my first 20 inch smallmouth of the year. Fortunately he hit my top lead and manged to stay clear of the rest of my leaders. When one that big hits the kicker lure he has a tendency to tangle up everything. I also caught a few more throwbacks in the 10 inch range. These would be walleye from last year’s hatch. The trawl results indicated that 2016 was a below average hatch but that was out in Lake Erie. I really would like to know how many walleye successfully spawn in the river. Around 11:00 pm the weeds started up and fishing became a drag, literally. At one point I hit a patch of weeds about 20 yards long and 10 yards wide. By the time I saw it it was to late and all 3 of my lines caught it. The drag created by the weeds turned my boat around and headed me downstream. It took me about 20 minutes to get everything clear and get back up to my spot. From then one I was clearing lines every 5 or 10 minutes. I was debating heading in but whenever I did I would lose a walleye or catch another dink. I figured it would just be a matter of time before I would fill out my limit. Around midnight I did just that. I was pulling in my lines to clear the weeds and a walleye grabbed my kicker lure just as I was about to pull it out of the water. Either he followed that lure up or he was cruising the surface chasing baitfish that were feeding on the few emergers or spinners I saw on the surface. Either way I was done and headed in. Perseverance and a little luck paid off tonight. A few observations about tonight, the first being that you can catch walleye during a mayfly hatch. 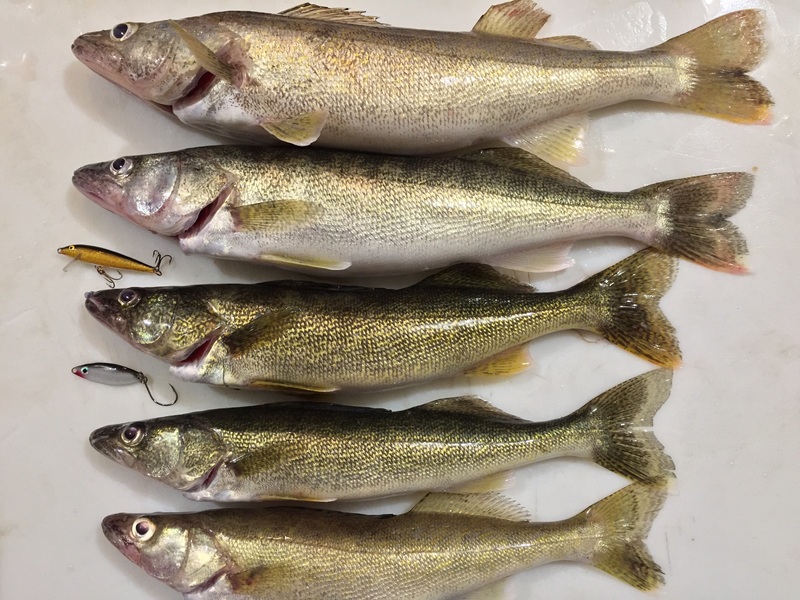 The other being that the only absolute when it comes to walleye (or any fish for that matter) is that they are going to do whatever they damn well please. 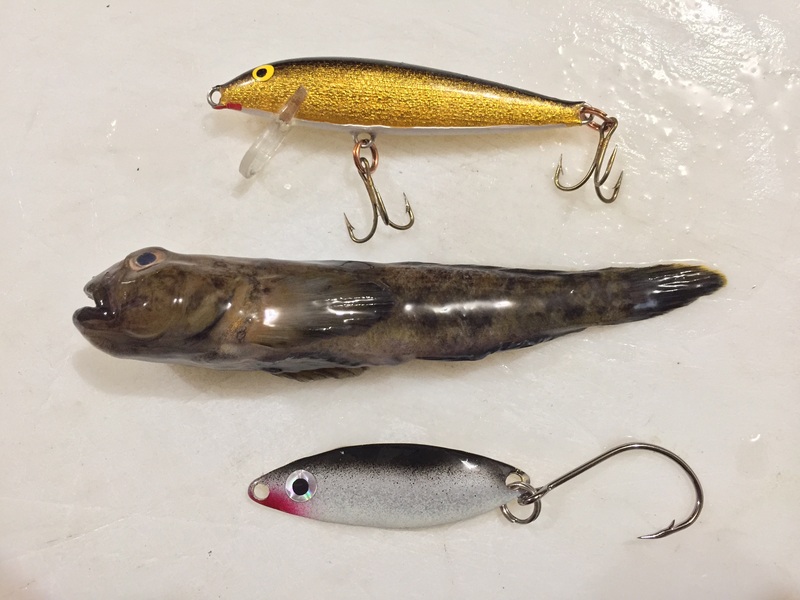 As you can see in the pictures the walleye wanted small baits, about the size of an emerald shiner. When I got home and cleaned them one walleye had a goby in him that was about twice the size of my lures. None of the walleye had any mayfly nymphs in them. Other than the goby I didn’t find anything else they had been eating. So take it for what it’s worth. You can catch walleye before, during and after a mayfly hatch, size does matter and matching “the hatch” doesn’t always pay off. I ran #9 and #11 Rapala’s in darker colors and I never caught a fish on any of them. This past Friday evening started off pretty much the same as the prior one. I was back walleye fishing in my usual spot at 9:30 pm. Conditions were pretty good, partly cloudy skies with a slight NW breeze. Boat traffic was a little higher than normal and in about 30 minutes I was about to find out why. No matter though, I got set up and started my usual routine for night fishing when the other fish are in. About 5 minutes in I had my first fish on and it turned out to be a 23 inch male walleye. That was soon followed up by a second 21 inch male. I was beginning to think that maybe the other fish had left. That things would get back to normal. That I wouldn’t have to constantly be pulling lines in to remove unwanted accidental catches. I was wrong. Around 10 pm I sensed a flash of light behind me and then a resounding boom. Grosse Isle was shooting off fireworks, thus the reason for the increased boat traffic. Shortly after the start of the show I picked up a third walleye and it would turn out to be my last one for the night. Once the show was over all the boats headed for the docks and after that it was nothing but the other fish for the next few hours. My last fish of the night turned out to be a white perch that had a brush with a muskie. When I flipped it in the boat it had teeth marks across both sides. Lucky little bugger. Hope I never lose that Blue & White PP. It’s the only one I have. Chores. I did find another Blue & White Pencil Plug while I was cleaning out the garage. Day wasn’t a total waste of time after all. Sunday started off with me attending Demo Days at Schultz’s Outfitter’s. This is an annual event full of fly fishing, tying classes and demonstrations. I signed up for the Micro Spey – Trout and Smallmouth class presented by Tom Larimer. When spey fishing first arrived in Michigan it was all about Steelhead. Lately though there has been an interest in scaling things down for the resident Brown & Rainbow Trout and Smallmouth bass. Tom has been heavily involved with this, working with both G. Loomis in developing fly rods specifically for this and lines from Airflo to go with them. Since I enjoy spey casting so much I wanted to learn how to incorporate what I have learned so far into catching the aforementioned species. Class started off indoors at first with discussion about presentation, reading water and fly selection. After that we wadered up and were standing in the water casting. Tom brought along two prototype rods from G. Loomis and worked with each of us on our spey casting. I like to think that I am getting better but after watching Tom I quickly realized I have a long way to go. He did point out a couple of small items that I need to work on. A couple of the finer points of setting “the anchor” that when done properly make a huge difference. When I don’t do it things get ugly. Just like anything else that is new I need to practice more. I figure I’ll go down to the river a few times a week with my spey and switch rods and do just that. 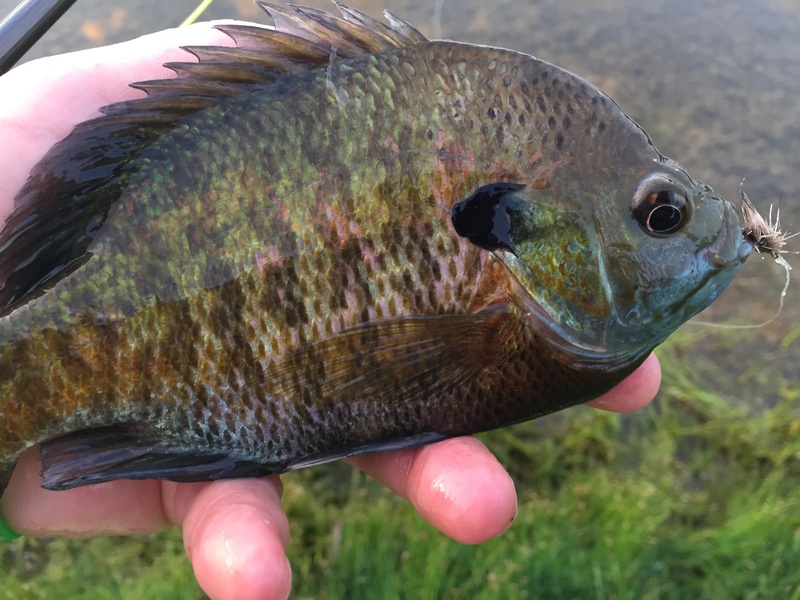 Later that evening I grabbed my 5wt fly rod and headed to Washago Pond in Willow Metropark to play around with the bluegills. Susan and I used to go to the park about once a month in the Spring and Summer. She would read and take pictures while I fished. Afterwards we would drive around and look at the deer or whatever other critter might be out and about. Now it’s just me and the fish. When I arrived around 8:00 pm it was dead calm and no sign of any surface activity. Usually the swallows are skimming the surface trying to pick off newly hatched bugs, not tonight. Undeterred from the lack activity I walked over to the edge of the pond, tied on a #14 Elk Hair Caddis dry fly and went at it. The fly wasn’t on the surface for a second when the first bull gill smacked it. About a minute later he was in hand. The first of about 2 dozen. This continued on for the next hour. 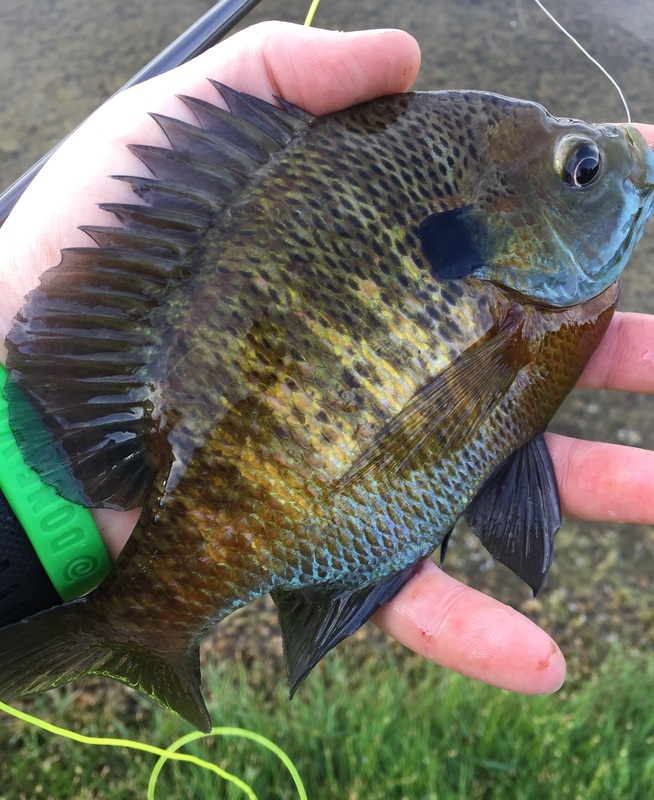 Every other cast resulted in another nice gill. Eventually my dry fly started to turn into an emerger/sub surface fly and then a slow sinking fly. I could of changed flies but it was still working so I didn’t bother. The last few caught were strip sets. I would see a subtle swirl where I thought my fly was and once I gave a tug I could feel the weight. I must admit though, I tied that fly right. It never fell apart, even after being almost swallowed by most of the fish. Around 9:00 pm fishing started to slow down so after one more fish I packed it up and went home. My elbows and wrists were getting sore from all the fly casting today anyways. I can always come back. In the immortal words of Porky Pig….”That’s All Folks“. Afterwards I drove around the park to watch the deer, just like Susan and I used to do. There were about a dozen of them out, most with their summer cinnamon tan already. No fawns yet, they are probably hunkered down somewhere safe from the resident coyotes. Perfect way to end the weekend.